During the day, the halls of Marian Hall — one of 12 student residences at St. Mary’s — are quiet. But at night, the scene is much different. As St. Mary’s University’s designated science living community since 2011, and one of eight academic and themed living communities on campus, Marian’s 120 residents are all science majors, busy with classes and labs most of the day. 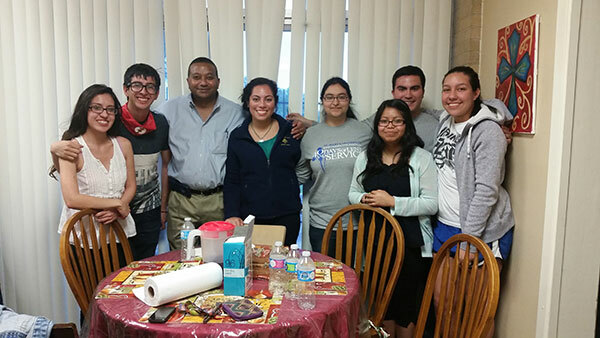 School of Science, Engineering and Technology Dean Winston Erevelles, Ph.D., poses with Marian Hall residents after cooking them dinner. Then, on most Friday nights, the students’ activities range from going to the gym and watching Netflix to playing cards and video games. The benefit of having science majors living together, Moncada said, is not only to form tight-knit bonds with people of similar career interests, but to foster individual academic success. Take Megan Medrano, senior Biology major, who’s lived in Marian for more than three years. Xiomara Cuadra (B.A. ’16), a Mathematics major, echoed Medrano’s words. The only requirement for living in Marian other than being a science major is attending four programs or events per semester, primarily arranged by the hall director. They include monthly visits from professors from different departments, such as a popular liquid nitrogen ice cream exposition put on by Chair of the Physics and Environmental Sciences Department Richard Cardenas, Ph.D.
Erevelles admitted the tradition actually began in jest. A student once asked Erevelles, who was born in South India, where to find the best Indian food in town; Erevelles replied with his home address. The student didn’t believe him, which meant only one thing: the dean had to show he meant business in the kitchen. And the results have hit the spot; his most recent dish was a coconut milk-based South Indian beef stew. “The food is simply an enabler to hang out and spend a few hours with our students, get to know them and their interests and concerns,” Erevelles said. No matter the case, whether students prepare for a difficult test or share a meal, Marian is about one thing.